Many have remarked upon the parallels between Santa's naughty list and mass surveillance, but the idea that a supernatural being is watching your every move and judging you for it is a lot more pervasive than just the Santa story: it's the bedrock of Christianity. After all, "the very hairs of your head are all numbered." 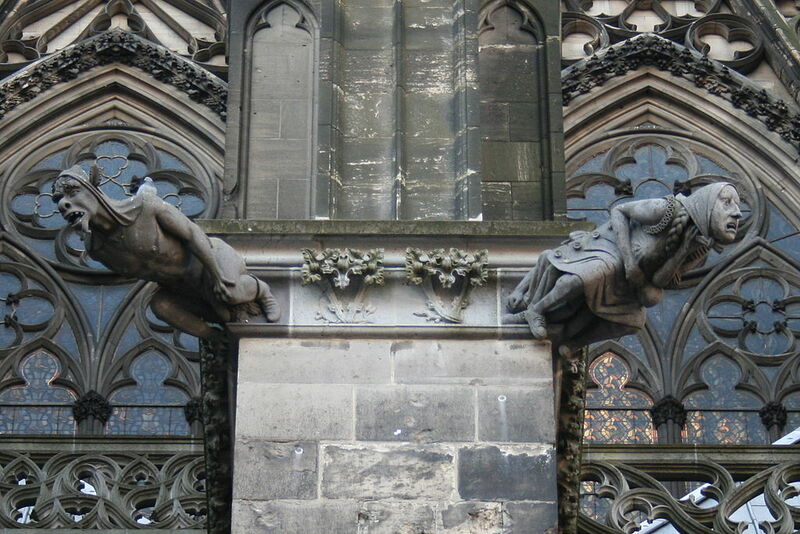 On my first visit to Vienna, my London-trained peripheral vision kept spotting CCTVs out of the corners of my eyes, which always turned out to be gargoyles. I have ever since thought of gargoyles as medieval CCTVs: a reminder that someone could be watching and judging you right now, a reminder to stay in line. Oxford Medieval history professor Amanda Power has written a long, fascinating history of the use of the threat of total surveillance and continuous judgment as a means of social control through the medieval era, a time in which the vast majority of people had it very bad, and a small elite enjoyed unimaginable privilege. It's a fascinating read, and the parallels can't be denied. If we imagine cynical rulers and a credulous population, however, we have got it wrong. Some of those most vigorously committed to the pursuit of salvation through the Church were prominent members of royal or noble families. There were intricate connections between their spirituality and their performance of public roles. There are numerous examples of elite women subjecting themselves to intensive regimes of confession and penance, not infrequently resulting in early death. Their actions conferred distinction upon their families and enhanced the moral legitimacy of the dynasties to which they belonged. One was Elizabeth of Hungary, daughter of the king. From a young age she was greatly influenced by the prevailing modes of pious behavior. After her husband’s death, she became closely involved with her confessor, the notorious inquisitor Conrad of Marburg, and under his direction she embraced extremes of self-scrutiny, punishment, and self-discipline, which she pursued as part of an exercise in complete submission to God. She died in 1231 at the age of twenty-four. Shortly afterward a papal commission inquired into her possible sanctity. During the inquest, four of her former companions testified to her sufferings. One reported: “Master Conrad repeatedly tested her constancy, breaking her will in every way and ordering her to do things contrary to her nature…He took away from her all of the human solace that she had in us, wanting her to adhere to God alone.” On the same occasion, another former handmaiden said Elizabeth “used to fear Master Conrad a great deal, as if he were God, saying, ‘If I fear a mortal man this much, how much more to be feared is the omnipotent Lord, who is the lord and judge of all things?’ ” Reports were collected of the many miracles she had wrought, in life and posthumously, among the population. She was speedily canonized.